This is a preview of deals that are valid starting on Sunday. CVS offers a lot of profitable deals again. Scott bath tissue, Scott paper, and more cleaning supplies or household product purchases can be a $10 ExtraBucks if you spend $30 on them. Use coupons to save on Colgate optic white today. More ExtraBucks are possible to earn with purchases of Maybelline cosmetics, Physicians Formula, Covergirl, and more brands. Earn $5 ExtraBucks rewards when you spend $20 on Coke, Total Home bowls, cups, etc. and more on pg 2. If you like to have some snacks around, this can be your place to shop some. There are many discounts including the coupons. Cadbury egg 1.2 oz., Hershey's Easter Kisses are on sale. Stock your coffee with the deals from this ad and save on Folgers, Cafe Bustelo or Peet's coffee K-cups. Get $10 ExtraBucks rewards when you spend $30 on Hefty trash. $5 Extrabucks rewards on Tide PODS. Spend $20 to get the rewards. CVS has Early Easter savings on more sweet snacks like Lindt Ferrero gift candy, Hershey's Easter or Cadbury eggs multipacks. 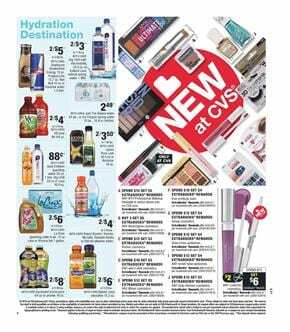 The new ExtraBucks rewards, top brands, promotions, coupon savings, BOGO Free deals are the major discounts from the CVS Weekly Ad beauty products Mar 3 - 9, 2019 preview. Browse the preview pages for all the deals from this cosmetics sale. You will save $60 in total with additional CVS savings. Spend a certain amount on some products to get more rewards. L'Oral facial care, Garnier Nutrisse, Olay facial care, Cetaphil, John Frieda, and more are products with ExtraBucks rewards. Visit pg 5-7 to see an extensive sale covering all these items. Personal care section is also a great place to shop some products like Sensodyne, Colgate, feminine care, Gillette, Xtreme, CVS brand items. Extracare coupon center can be even more saving on CVS beauty range this week. The deals are effective starting on Sunday. CVS also has a deal with scripts. Earn more ExtraBucks when you fill scripts at CVS. View the details on pg 6. Check out more ExtraBucks on pg 7 where you can find skin-care, beauty, hair products, and more. You will feel comfortable when buying stuff at CVS Stores. It's really a good place to earn a lot of rewards and take discounts on important weekly supplies. Health-care range of the CVS pharmacy can be seen on the final part of the ad. Follow our Facebook page for the updates, subscribe to CVS Weekly Ad page to get emails. 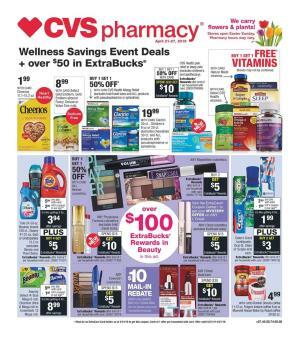 CVS Weekly Ads are great online sales for snacks and household products as well as a pharmacy. BOGO free deals, coupon savings, ExtraBucks rewards are also available for products like Bounty, Charmin, Tide Oxi. Browse pg 1-2 for deals under $5. Breakfast foods like General Mills are also on sale. Restock your candies, coke, walnuts etc. Select Gold Emblem products will be only $4.99 at CVS stores. A lot of candy brands are on sale. Starburst jellybeans, Brach's classic jelly bird eggs, Reese's peanut butter, and more are on sale. You can save and earn rewards. 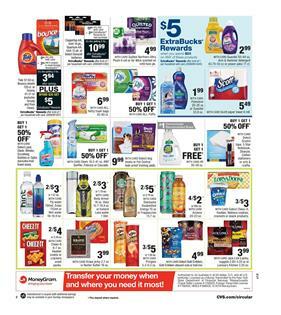 Earn $5 ExtraBucks rewards when you spend $20 on Clorox, Kleenex, Cottonelle that are available on pg 3. Trident, Dentyne, Swedish fish or Sour patch will be 3/$3! Dawn ultra, Air Wick, Finish are also on sale. Look over the discounts on popular snacks like Gold Emblem, Planters, Chips Ahoy!, Reese's, Campbell's, Lay's, Cheetos, and more items. Next week is the right time to shop pharmacy and personal care items. Nature's Bounty, CVS health, Flonase, and more brands are on sale. Buying certain amounts of these products will earn you ExtraBucks rewards. Find BOGO deals on favorite snack brands, candy bag, chocolate bars, and much more on CVS Weekly Ad Feb 24 - Mar 2. You can personalize Lindt Gold Bunny on the official page of the product on CVS site. See the mfr's coupon discounts on Reese's, Twizzlers, Dove eggs, Peeps, Hershey's, and much more. The candy bags of the brands are available on pg 4. Find Pringles with a nice price on pg 3. Jack Link's jerky, nuggets or Lorrisa's kitchen will be only $3.99 this week. A soft beverage like coffee, iced tea and more are also available. Fiji water, Body armor, Starbucks doubleshot energy, Arizona, and more items are available on pg 3. Breakfast food variety is on sale, too. Find milk, white or wheat bread, Nature Valley one bars, Folgers coffee, Kellogg's cereal on pg 5. Dove promises chocolate dipped fruit or nuts, Lindt, Toblerone, Ghirardelli, are all on sale. DiGiorno pizza pack or Stouffer's will be 3/$10! Check out these offers that might be profits out of this week's shopping. Discover more deals and get them in your inbox. Subscribe to CVS Weekly Ad for the future deals. 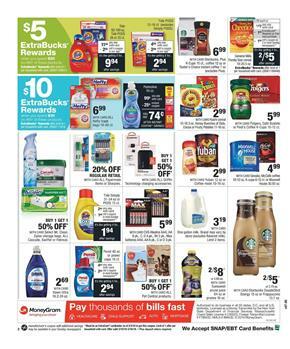 This the latest CVS Weekly Ad Preview that shows the deals which will be valid on Sunday for one week. You can browse health care products such as medicines, ExtraBucks rewards for your possible purchases, coupon savings, medicines like allergy relievers, Zyrtec, Claritin, and more brands or products. Customers can collect rewards, shop their routine medicines for lower costs at CVS stores this week. This ad demonstrates how much you can save and what you can find with discounts. You can see a lot of coupon savings and BOGO deals on pg 7. The ad has offers of CVS health brand smoking cessation products. Nicotine Lozenge, Nicotine transdermal system patch purchase will give you $10 ExtraBucks rewards wyb 2. Also, get more savings with ExtraCare coupon center. Crest toothpaste or Fixodent will be BOGO 50% off deals next week. 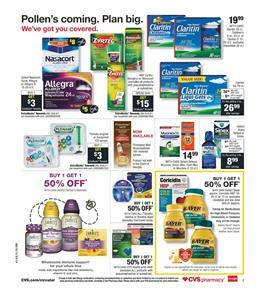 Check out pg 9 for allergy relievers, Claritin, Delsym, Flonase, and Bayer products. Boost your savings with ExtraBucks rewards and BOGO deals. Moreover, the baby care category has special offers next week. infant formulas of Gerber, Good Start, baby food or juice is a $10 Extrabucks rewards deal! Get $3 ExtraBucks when you spend $12 on Aspercreme food care or Gold Bond. 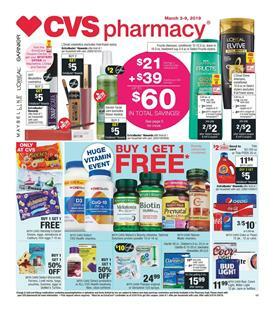 Check out plenty of BOGO free deals on CVS health, Nature Made, Flinstones, Emergen-C products on pg 14. BOGO vitamins will be a great deal, too. Subscribe to CVS Ad to get newsletters, emails about the future deals. You can alternatively follow our Facebook page where we share all the posts.